In the NICU – Page 2 – #lovenotesfornicholas – the story of HELLP & how 1 micro-preemie changed our lives forever. I’ve often heard that naming a child is one of the hardest decisions you’ll ever make. For Andy & I it was a bit comical at times but, in the end, our son’s name came pretty easily. Shortly after we found out we were pregnant, folks started asking “what names are y’all considering?”. To be honest, we weren’t. We were in the very beginning of our 2nd trimester and were enjoying just “expecting” our 1st child. We hadn’t found out whether baby Szapacs would be a boy or a girl yet (although if you asked Andy, my father, his father, or my brother they already knew- it was a boy) and I struggled with not wanting to place a definitive name on a soul I knew so little about. As we begun to plan Baby’s nursery and learn about products other moms & dads couldn’t live without, the name discussion was never far from our minds. I ordered a few baby name books and, each night as we sat in bed, I would read a list of names from one of the books out loud and Andy would say “yes” or “no” depending on his initial reaction. This method really got us nowhere (on a side note: if you know someone looking for baby name books I’ll happily contribute our gently used ones to their cause.). I have always been a proponent of family names myself. Knowing you were named in memory/honor of someone who has come before, to me, is a special thing. Andy & I joked that most of my family names (Doug, Jack, Lester) wouldn’t fit well with Szapacs. Andy also had some strict guidelines as to the syllable flow of a name. (Next time you see Andy just ask him). I remember the day we learned we were having a boy very vividly. We spent the day telling friends and family our good news (and yes, telling all the men they were right). That evening as we were winding down our day, I stood in our closet, turned to Andy, and said “Nicholas Christopher. Think about it.”. No matter what other names we came across, nothing stuck with us like Nicholas Christopher. And so, it was. Nicholas Christopher is a named after 2 important men in our lives. 1st, Nicholas comes from Andy’s Uncle Nick. There are only a rare few folks in Andy’s life that, at the mention of their name, bring tears to his eyes. Uncle Nick is one of those people. Uncle Nick was a 2nd father to Andy seeing him through scouts, teaching him to hunt and fish and that nothing feels better than a hard days work. Uncle Nick rarely missed an event in Andy’s life- he even drove Andy to Penn State one year and helped him move into school. Uncle Nick has meant a lot to both of us – most recently he was was even our proud ring bearer at our wedding. Now, Christopher. Christopher comes from Phil Christopher – my dad. Phil isn’t just dad to me -he is one of the best kinds of dads around- a dad who didn’t have to be. My father passed away when Parker (my brother) and I were young. Phil married my mom and became dad to a melodramatic, headstrong, girly-girl (me, of course). He sat through countless dance recitals and competitions, taught me to drive, showed me what “hard work” really meant, and is the reason I am a solid businesswoman today. (Yes, he also sat through many a dramatic “my world is going to end if I can’t have/do/be allowed this one little thing” tantrums but I prefer to skim over those parts.) Over 20 years later, he stills loves me as his own. Having him walk me down the aisle and dance on the dock at the lake with me on my wedding day are memories I will never forget. A dear friend from work wrote me a few weeks back and reminded me that the reason we were put on this earth was the love and serve others. Amen. Nick and Phil embody her words and our thoughts – and are the perfect names for our son. 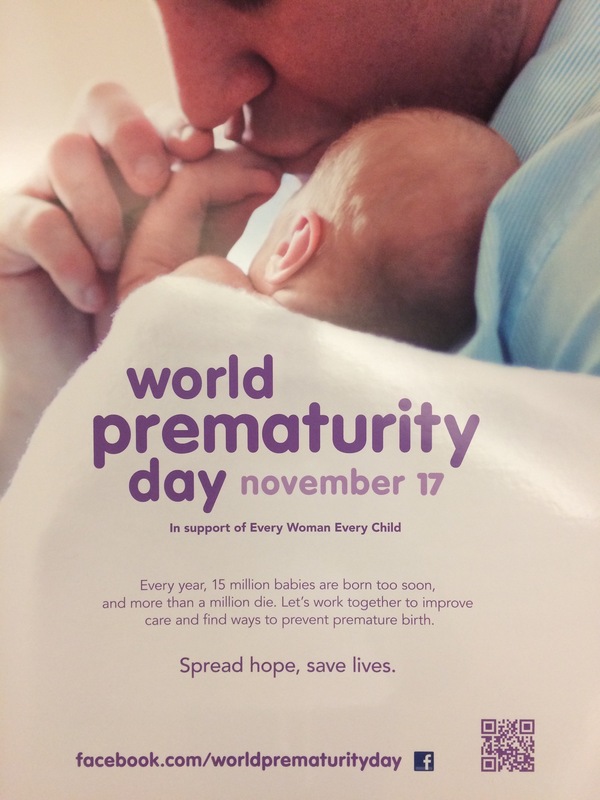 The day brings awareness to the fact that each year, 15 million babies are born premature and each year, over 1 million do not survive. As a new mom (and recent inductee into the preemie-parent club) these numbers do not shock me (but they do sadden me). While Andy & I know that Nicholas’ early birthday could not have been diagnosed or prevented any earlier than it was, we understand some early birthdays can be prevented. If you would, take a few moments today to join us in giving thanks for the blessing that is our son Nicholas and praying for others who are on the same journey we are. Nicholas got his 1st out of state visitor this week – Aunt Carmen (my step-sister) came into town for an all too brief but appreciated visit. Aunt Carmen arrived Saturday from NC and spent a day and a half with us visiting Nicholas in the hospital (and soaking in some SW Florida sun!). Thanks for coming, Carmen! 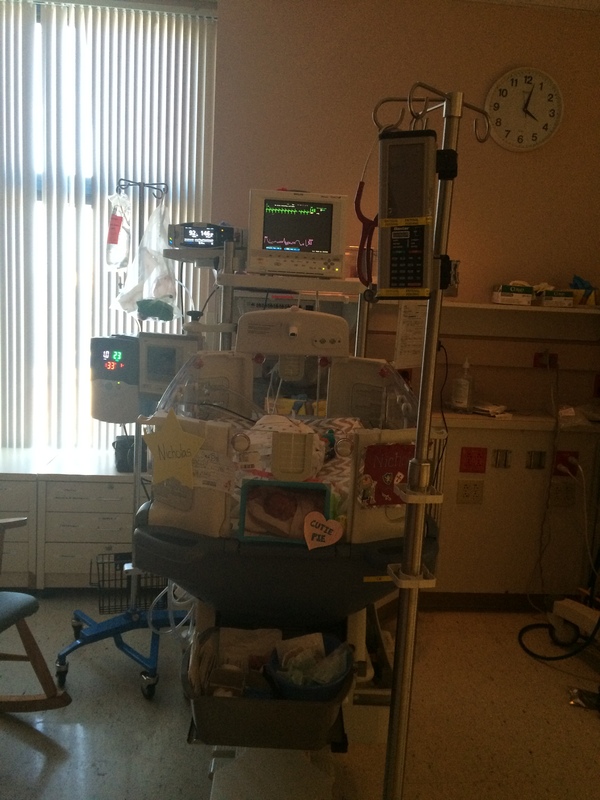 On Sunday, Nicholas was still breathing on his own with only pressure support from the CPAP machine. His oxygen levels and heart rate were fine but his respiratory rates were high. And when I say “high” I mean “holy cow, that’s high.”. His respiratory rate should have been no more than 70 breaths per minute (bpm) but he was at 140 bpm at points throughout the day. As Andy and I sat with him and watched him breathing like someone who couldn’t catch their breath after running a marathon, we grew concerned. All of this tachypnea chatter got me thinking. I remembered a day a few weeks back when he was having trouble breathing. The respiratory therapists thought having me hold him may help with his breathing. I held him for 2 hours and his rates did normalize. I didn’t want to hold him this time because his temperature was low (another sign of stress) so instead, I chose to read to him to see if it would help. I sat and read “Winnie The Pooh” for over an hour. Nicholas was alert the entire time looking around, smiling, and holding my hand while we read. As we continued to read, his respiratory rate came down within the “normal” range and, I’m amazed to say, he stayed within normal range all night long. Over the next few days, we patiently waited tried to be patient as we watched his respiratory rate slowly even out. We pulled out our old mantra of “deep breaths, buddy, deep breaths” and sat with him day in and day out doing everything we could to help him breathe better. We continued to work with the team of occupational therapists learning new techniques to help with diaphragm muscle recall, and even sat by his bed and over exaggerated our own breathing cycles for him (a lot of deep breaths make for lightheaded parents!). By Friday, he was beginning to show signs of progress and looking much more confident breathing. He was also showing a bit more weight gain- by Saturday night he weighed 3 pounds 6 ounces! We know that with every ounce gained more and more of his breathing will become easier and more natural so we are thankful for every ounce. On Thursday, Nicholas got a sweet surprise. My cousin Jordan flew down to spend 4 days with us. And, let me tell you what a God-send she was for us (especially me!). I had missed her greatly since being in FL and having her here provided another piece of home that I miss. She spent much of her time here with us traveling back and forth to the Children’s hospital and hanging with us for hours on end in the NICU without so much of a “Gee, isn’t there anything else to do in Fort Myers besides tour the NICU?” ever being uttered. She also provided a nice distraction from our routine – she was the reason I took my first boat ride since being down here (with my own health issues and spending time with Nicholas I haven’t had much desire or energy to do much else – especially go out on the boat). We spent one morning on the boat as a family sightseeing the area from the water, putted around in the Gulf Of Mexico, and even got up close and personal with a pod of dolphins. It was a good morning together as a family. Thank you for coming, Jordan- we all love you very very much! Andy had to be back in NC for a few days this week. Its a hard adjustment for me when he has to travel home because what little normalcy I have here unravels (and trust me, there isn’t a lot of ‘normal’ to begin with!). Not to mention, the timing of this trip wasn’t ideal – we were in the midst of a blood transfusion ending and an infection beginning. On Sunday, as I headed to the NICU, I learned that the blood transfusion was a success but that Nicholas’ blood work was showing signs of an infection in his bloodstream – the type of infection was yet to be determined. Dr. Sultan began Nicholas on a round of antibiotics that would last a minimum of 3 days until he could learn more about the infection and hopefully nip it in the bud before it go out of hand. We spent the next 4 days having chest x-rays and blood draws every morning to monitor the infection until Dr. Abril (our primary physician who was now back!) was confident the infection had cleared. On Wednesday evening Nicholas received his last dose of antibiotics. Dr. Abril wanted to leave his IV in for a few days to make sure the infection didn’t need anymore attention but, on Thursday morning, Nicholas managed to kick the IV out himself. Fortunately, the infection was gone and we didn’t need another IV put in. Nicholas got his way – no more IV. On Monday, I met with the team of NICU “occupational therapists” for the 1st time. They. Are. Simply. Amazing. Through touch and massage they are able to help with muscle recall that otherwise premature babies would be missing out on since most of their muscle recall happens in the womb. I could see the difference in Nicholas almost immediately. He became more alert to our touch and voices and less resistant to medical touches (ie – blood draws, suctioning, measuring his growth). I’m thankful for their non invasive ways of helping Nicholas adjust and grow to life outside of the womb. We get to see them 3-4 times a week while in the NICU and I think both Nicholas and I look forward to their visits. Nicholas remained on the NAVA ventilator at the beginning of the week. He was maintaining his breathing much better than he had been in the past few weeks. On Monday, I began to hear murmurings that he might be strong enough to take him off of the ventilator and move him to bubble CPAP. 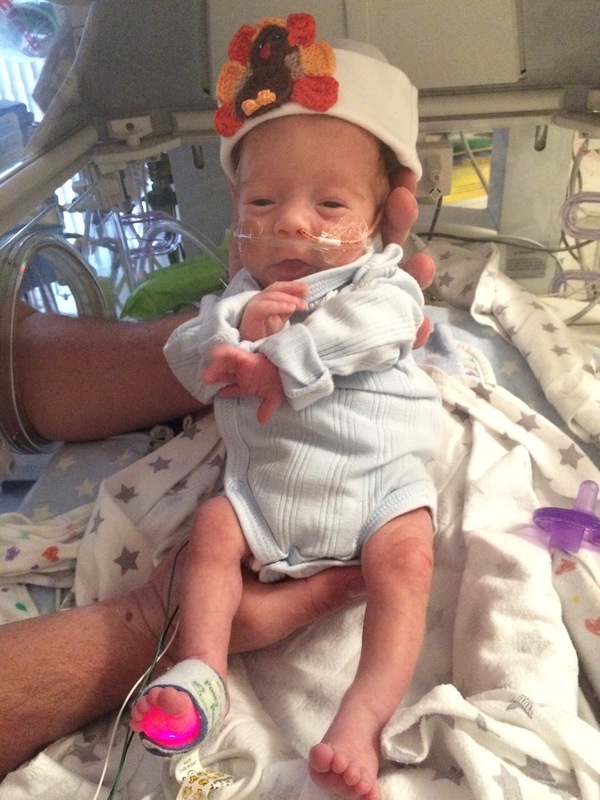 This would be a large step for us as he was still small – weighing on 2 pounds 12 ounces. 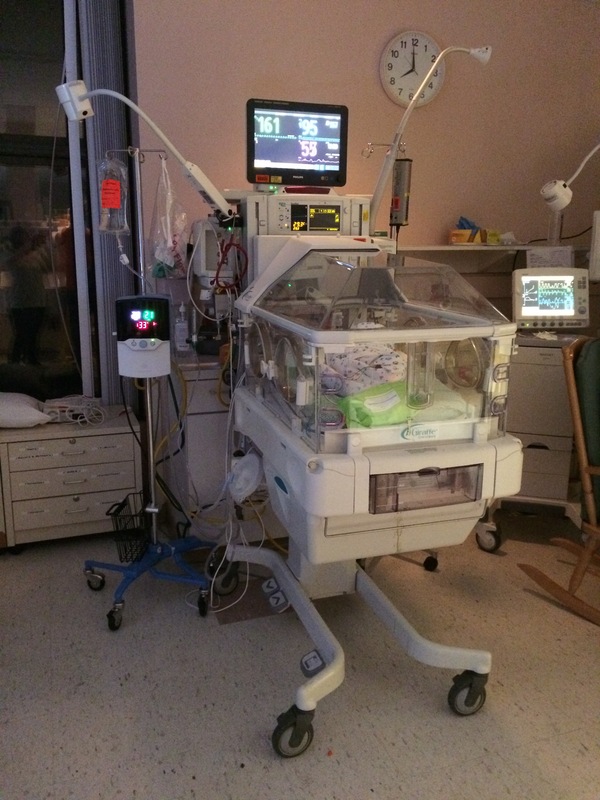 Bubble CPAP is a machine that allows Nicholas to breathe completely on his own and provides constant oxygen pressure support to help strengthen his own breathing patterns. On Wednesday evening as my dad & I left the NICU and were headed home for the night, I received a phone call from the NICU. Jovita, our primary nurse (more on Jovita later), explained that Nicholas had successfully pulled his ventilator tube out of his throat and mouth for the 5th time that day and so, Dr. Abril decided to take the hint from Nicholas that he didn’t want to be on the ventilator anymore and moved him to Bubble CPAP. Just like that, one of Andy and my BIG goals was being accomplished. I understood the next few hours would be touch and go – if he didn’t take to CPAP well, he would go back onto the ventilator (and the tube would have to go back in). None of us, Nicholas included, wanted that tube back in. Thankfully, Nicholas did just fine on CPAP. The respiratory therapy team removed any sign of a ventilator from his area in the NICU and we moved forward on the CPAP machine. Andy made his way back to Florida on Thursday evening – just in time to see Nicholas end his 1st successful day on the CPAP machine, and see our him with one less tube and no more IVs. During our bedtime routine that evening Andy got to witness Nicholas’ 1st weight gain all week – we were now up to 2 pound 14 ounces. That was a huge gain for us considering at the beginning of the week he was NPO (no food) during his transfusion and was also on antibiotics for 4 days. We spent much of the weekend watching Nicholas succeed on the Bubble CPAP machine and becoming more & more alert than he had been in weeks past. We know he cannot see us clearly right now but it is simply amazing to watch him follow our voices when we talk, read, and sing to him. We continue to work with him through the massage and touch tools that the occupational therapists have shared with us and are happy to see his responses growing stronger.